Wigan midfielder Jimmy Bullard will join Fulham at the end of the season in a £2.5m deal. The 27-year-old has agreed a four-year contract and will move to Craven Cottage when the transfer window re-opens on 8 May. Latics boss Paul Jewell said: "The timing is not the best but I understand Fulham wanted to move quickly and not lose their man. "Jimmy is sad to go but he sees this as his next step in his career." An initial bid by Fulham triggered a clause in Bullard's contract and Jewell added: "We had to have the clause as he would have otherwise been out of contract. The Wigan boss revealed Bullard's agent had demanded the clause be a part of his contract, otherwise he would not have signed and would now be able to leave on a free. "He had this clause that he could go for a certain amount of money and that has been exercised by Fulham. "We don't want him to go but wish him all the best for the future." 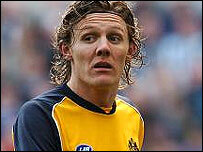 Bullard joined Wigan from Peterborough for £275,000 in January 2003 after spells with Gravesend and West Ham. He has made 42 appearances this season and scored four goals for Jewell's side. Jewell added: "We're getting ten times what we paid for him. Jimmy's been fantastic for us, he's not missed a game, he's a great lad but once someone says he wants to leave and there's a clause in his contract, what can we do? "If we had decided to match Fulham's offer then maybe we would have kept hold of him but I didn't want to set a dangerous precedent and be held to ransom. That would be extremely unhealthy."